Say bye-bye to messy floors with this perch. It has an easy on and off cup, and is designed to reduce the mess on your floor by putting the bowl in the center of your bird's cage. The perch is comfortable with a secure non-slip gripping surface and the non-porous surface is easy to clean. Cleaning Instructions: Place the cup on top shelf of dishwasher. DO NOT place perch in the dishwasher; it washes easily with soap and water. Polly's Mess Less Perch Cup Small Dimensions: 11 " Perch with a 3/4 " diameter and 10 oz. cup. 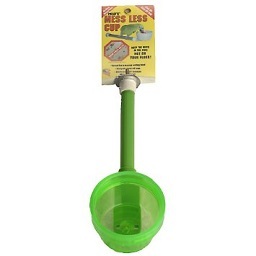 Notify me when Sm Mess Less Perch Cup- Polly's is in stock.